Large, small, Yellow. – Dirty wet dog , boats and sailing. Its an odd thing when i think back to my maxi-yacht days but the one boat that i did a huge amount of my sea miles on and worked on/struggled with was possibly just about the worst sail boat that i ever had anything to do with. The irony of course is that it gave a whole load of people the experience of sailing in the then premier ocean race and then went on to give even more people access to sailing at least part of a circumnavigation. I need to explain that a little especially for anyone from the same era and of course anyone who actually sailed on that boat. Originally the boat was designed and built for an earlier Whitbread race but was built and finished on an extremely tight budget, so tight in fact that not even the deck was built properly and water just poured through as the boat twisted and flexed. Originally it was designed and built to have a large fractional rig but just didn’t have the budget for the huge sail wardrobe and replacement sails required. If i am right the rig just fell down and the boat was eventually abandonned in a south coast boatyard where it festered until it was bought by a trio of keen individuals who decided to refit it to sail in the 89-90 edition of the race. A complete new deck did get built and a new secondhand rig did get put in : except that the new rig was a masthead one but was put on the original step such that the boat always had chronic lee helm up until the point it was overpowered. As a secondhand race boat run by willing and hard working amateurs of which i was one it did get round the world with lots of effort but did also have the tragedy of losing 2 crew over the side in the southern ocean : both were recovered but only one survived. For me now the race is little but ancient history and i hardly ever think about the boat or the race, the boat is now i believe once more festering in another boatyard, her skipper of the race (John Chittenden) died a few years ago and i have to note so did the skipper of the other maxi that i sailed aboard in the same race (Bob Salmon). Recently though a friend asked me about some of my unique experiences and of course a lot of those were aboard the big yellow boat including my first passing the horn and being at the helm doing monster surfs in the southern ocean !. One of the best experiences was when i briefly sailed the boat completely solo just for an hour or so : the other crew and guests were actually aboard but it was evening and the cook had made an excellent dinner which really needed to be served to the entire crew in one sitting. I sent the entire crew below, pulled the hatch shut and with no sound from below sailed the boat alone on deck for maybe an hour and it was one of the most satisfying and serene hours of my life : an easy reach, a gentle beam wind and the lightest touch on that huge wheel….great moment . Connection between the 2 boats : none that i can see. I used to think that maxi yachts were the ducks nuts AND the bulldogs testicles, now i hardly give that era of boat a second glance : recently i went aboard a Whitbread/Volvo 60 and the most telling memory was that familiar nasty bilge stench of a sour and unloved boat. Today i enjoy the small and insignificant in boats, ones that are feasible for an old git to sail and enjoy and not make the bank manager weep ! 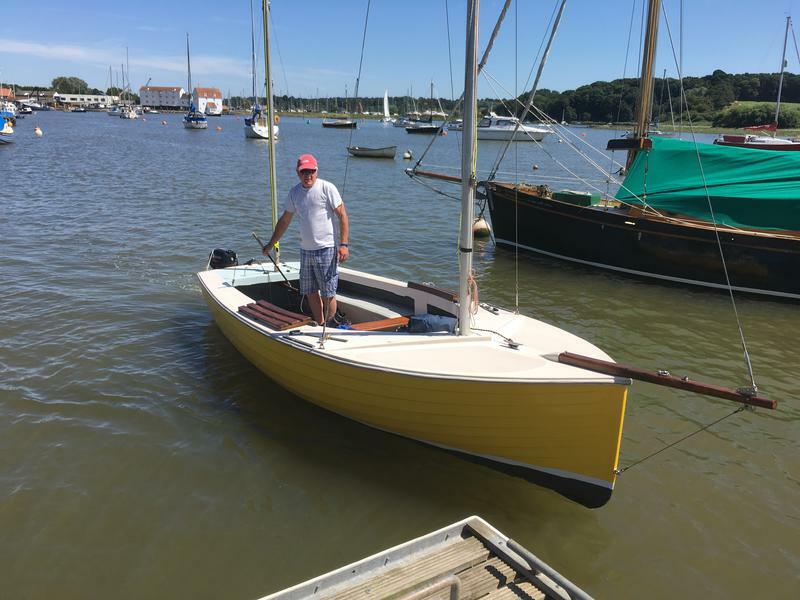 That Devon Yawl is a really beautiful boat, even if it’s yellow (not my favourite colour). It looks like the complete package at a good price. People will want to stop and talk to you that’s for sure. Devon yawl looks good, and sounds as though the work has been done it can’t be that heavy as its on a single axle trailer I am assuming its glass with a steel centre plate. probably make a good old blokes creek crawler with a boom tent and as long as it has room to sleep by the centre plate case sweet. The other big yellow bus was last seen in NZ about 3 years ago looking well used in a marina near Auckland not sure if its still there.